“We’re navigating Harvard," said Michael Swaine. 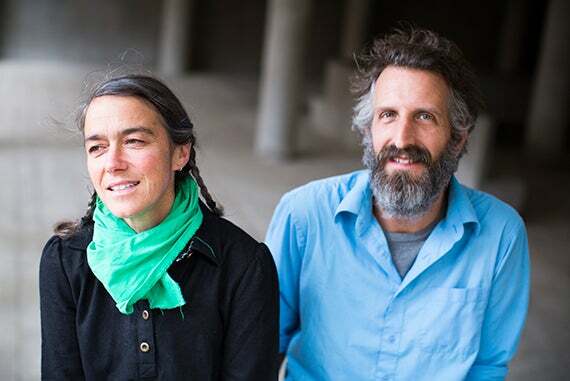 Swaine and Amy Franceschini (left) are members of the arts cooperative Futurefarmers. They will spearhead a project at the Carpenter Center. Celebrating process as much as product and incorporating verbal and visual puns into its socially informed art, the cooperative Futurefarmers introduced itself to the Carpenter Center for the Visual Arts on Thursday. Speaking at the Sert Gallery, longtime cooperative members Amy Franceschini and Michael Swaine discussed past and ongoing projects in multimedia, science, and agriculture — including their most recent, involving seeds and grains — and disseminated some ideas along the way. The duo were given a brief introduction by James Voorhies, the John R. and Barbara Robinson Family Director of the Carpenter Center, who admitted a bit of trepidation about the group’s research plans — which he had been told might include “large pneumatic tubes.” Franceschini and Swaine then began with a visual presentation of some of their early site- and source-specific work. These pieces include such projects as 2014’s “Forging a Nail,” images from which were shown on Thursday night. Kicked off by two interoffice memos found in Los Alamos, N.M., requesting both a small table and a nail (on which to hang a hat) for Robert Oppenheimer, then working on the Manhattan Project, the piece tackles the ideas of tools and utility, science and mortality — all with wit. “Mr. Oppenheimer would like a nail to hang his hat on,” read the memo, a request that was repeated in the follow-up. This led to the question of what type of nail would be appropriate for the man called the father of the atomic bomb. The collective made several, including one forged from a meteorite found in the Arizona desert, another of glass forged by the atomic test blasts, and one cast out of 1943 pennies, coins that for that one year — because of wartime shortages — were made of steel. Even the verbs used, explained Swaine, became part of the process. The word “forge,” he said, means “to beat.” But it also leads to “forgery” or fake. “Casting,” as the artisans did with the molten steel, is something one does with a shadow. It is also something done by a director who is assigning roles in a play. With images of the resulting nails (and the table), Franceschini and Swaine talked through the possibilities inherent in the seemingly simple request. Currently, group members are combining their interests in what they call a Flatbread Society seed journey, a seven-year project loosely based in Oslo. In the Norwegian port, the group has launched several projects, including gathering ancient non-GMO grains that have fallen out of use and constructing community ovens where people may bake the traditional, long-lasting Norwegian flatbread. The ovens, explained Franceschini, have already taken on a creative life of their own, as many in Oslo’s immigrant community — including many from the Middle East — recognized the basic hive shape from their own cultures. The next phase of the project will begin next October and involves sailing from Oslo to the Middle East. Stopping in London, as well as various points in Europe, the journey will transport scientists and farmers, along with their grains, re-creating ancient routes. “We’re taking the seeds we’ve grown back to their origins,” explained Swaine, noting that even though those origins are contested, it is likely that wheat — like most agriculture — spread north from the Middle East. “John Hope Franklin wrote history — discovering neglected and forgotten dimensions of the past, mining archives with creativity and care, building in the course of his career a changed narrative of the American experience and the meaning of race within it,” said President Drew Faust, giving the keynote address in the last of a yearlong series of events as part of the John Hope Franklin Centenary at Duke University.